Die Martis, videlicet, 10 die Maii. Message to the H. C. with the Paper delivered by Secretary Nicholas to the Messenger who was sent to attach Sir Tho. Darrell, &c.
Inigo Jones's Cause to be heard next Friday. Conference about the Magazine at Monmouth reported. Magazine at Monmouth to be removed to Newport. Earl of Worcester's Arms to be removed there also. No English to attend Mass at Foreign Ambassadors Houses. Chandler, Consul at Portugal, to be removed. English Papists belonging to Ambassadors not to pervert the People. Magazines to be under the Power of the Lieutenant of the County. Commission for the Sea Adventurers for Ireland. Absent Lords that have no Leave. Lords Lieutenants to give an Account how they have settled the Militia. Commission for the Sea Adventure for Ireland, sent to the H. C.
Committee to consider of an Alteration in the Colonels and Captains Commissions. Further Report of the Conference about removing the Magazine from Monmouth, and for suppressing the Growth of Popery. E. Worcester's Arms, &c. to be removed to Newport. No English to resort to Foreign Ambassaoors, to hear Mass. English Priests belonging to Foreign Ambassadors to be apprehended if they pervert the People. Magazines of each County to be under the Lieutenant. Mr. Chandler Consul at Lisbon sent for Home. 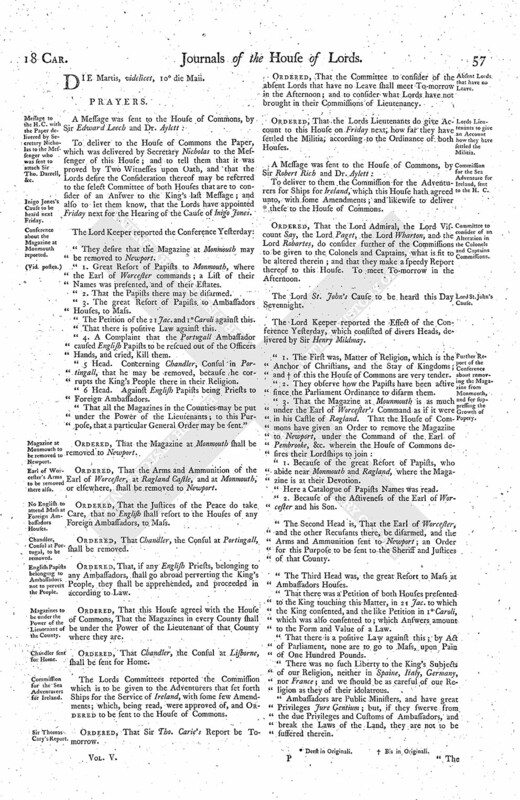 To deliver to the House of Commons the Paper, which was delivered by Secretary Nicholas to the Messenger of this House; and to tell them that it was proved by Two Witnesses upon Oath, and that the Lords desire the Consideration thereof may be referred to the select Committee of both Houses that are to consider of an Answer to the King's last Message; and also to let them know, that the Lords have appointed Friday next for the Hearing of the Cause of Inigo Jones. "They desire that the Magazine at Monmouth may be removed to Newport. "1. Great Resort of Papists to Monmouth, where the Earl of Worcester commands; a List of their Names was presented, and of their Estates. "2. That the Papists there may be disarmed. "3. The great Resort of Papists to Ambassadors Houses, to Mass. "The Petition of the 21 Jac. and 1° Caroli against this. "That there is positive Law against this. "4. A Complaint that the Portugall Ambassador caused English Papists to be rescued out of the Officers Hands, and cried, Kill them. "5 Head. Concerning Chandler, Consul in Portingall, that he may be removed, because he corrupts the King's People there in their Religion. "6 Head. Against English Papists being Priests to Foreign Ambassadors. "That all the Magazines in the Counties may be put under the Power of the Lieutenants; to this Purpose, that a particular General Order may be sent." Ordered, That the Magazine at Monmouth shall be removed to Newport. Ordered, That the Arms and Ammunition of the Earl of Worcester, at Ragland Castle, and at Monmouth, or elsewhere, shall be removed to Newport. Ordered, That the Justices of the Peace do take Care, that no English shall resort to the Houses of any Foreign Ambassadors, to Mass. Ordered, That Chandler, the Consul at Portingall, shall be removed. Ordered, That, if any English Priests, belonging to any Ambassadors, shall go abroad perverting the King's People, they shall be apprehended, and proceeded in according to Law. Ordered, That this House agrees with the House of Commons, That the Magazines in every County shall be under the Power of the Lieutenant of that County where they are. Ordered, That Chandler, the Consul at Lisborne, shall be sent for Home. The Lords Committees reported the Commission which is to be given to the Adventurers that set forth Ships for the Service of Ireland, with some few Amendments; which, being read, were approved of, and Ordered to be sent to the House of Commons. Ordered, That Sir Tho. Carie's Report be Tomorrow. Ordered, That the Committee to consider of the absent Lords that have no Leave shall meet To-morrow in the Afternoon; and to consider what Lords have not brought in their Commissions of Lieutenancy. Ordered, That the Lords Lieutenants do give Account to this House on Friday next, how far they have settled the Militia, according to the Ordinance of both Houses. To deliver to them the Commission for the Adventurers for Ships for Ireland, which this House hath agreed unto, with some Amendments; and likewise to deliver (fn. 1) these to the House of Commons. Ordered, That the Lord Admiral, the Lord Viscount Say, the Lord Paget, the Lord Wharton, and the Lord Robartes, do consider further of the Commissions to be given to the Colonels and Captains, what is fit to be altered therein; and that they make a speedy Report thereof to this House. To meet To-morrow in the Afternoon. The Lord St. John's Cause to be heard this Day Sevennight. The Lord Keeper reported the Effect of the Conference Yesterday, which consisted of divers Heads, delivered by Sir Henry Mildmay. "1. The First was, Matter of Religion, which is the Anchor of Christians, and the Stay of Kingdoms; and (fn. 2) of this the House of Commons are very tender. "2. They observe how the Papists have been active since the Parliament Ordinance to disarm them. "1. Because of the great Resort of Papists, who abide near Monmouth and Ragland, where the Magazine is at their Devotion. "Here a Catalogue of Papists Names was read. "2. Because of the Activeness of the Earl of Worcester and his Son. "The Second Head is, That the Earl of Worcester, and the other Recusants there, be disarmed, and the Arms and Ammunition sent to Newport; an Order for this Purpose to be sent to the Sheriff and Justices of that County. "The Third Head was, the great Resort to Mass at Ambassadors Houses. "That there was a Petition of both Houses presented to the King touching this Matter, in 21 Jac. to which the King consented, and the like Petition in 1° Caroli, which was also consented to; which Answers amount to the Form and Value of a Law. "That there is a positive Law against this; by Act of Parliament, none are to go to Mass, upon Pain of One Hundred Pounds. "There was no such Liberty to the King's Subjects of our Religion, neither in Spaine, Italy, Germany, nor France; and we should be as careful of our Religion as they of their idolatrous. "Ambassadors are Public Ministers, and have great Privileges Jure Gentium; but, if they swerve from the due Privileges and Customs of Ambassadors, and break the Laws of the Land, they are not to be suffered therein. "The House of Commons lately gave a Warrant to apprehend such of the King's Subjects as went to Mass to Ambassadors Houses; and One being apprehended as he went to the Portugal Ambassador's House, Sixty Yards from his House, there was a Tumult, and the Party was rescued out of the Hands of the Officers, by the Ambassador's Men and others, there being Swords drawn; and the Ambassador, in his Balcony, cried out, Kill, kill them: This the House of Commons hold to be an Affront of a very high Nature, and do think it fit their House be vindicated for this Affront, which they leave to their Lordships speedy Consideration. 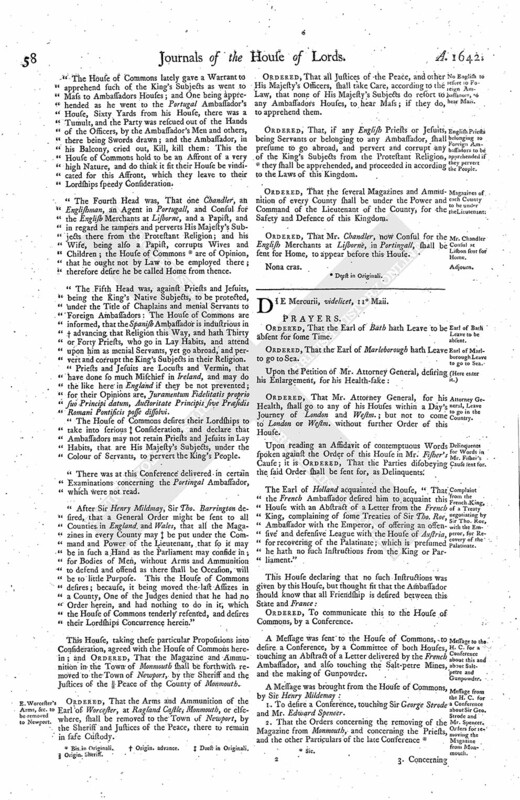 "The Fourth Head was, That one Chandler, an Englishman, an Agent in Portugall, and Consul for the English Merchants at Lisborne, and a Papist, and in regard he tampers and perverts His Majesty's Subjects there from the Protestant Religion; and his Wise, being also a Papist, corrupts Wives and Children; the House of Commons (fn. 3) are of Opinion, that he ought not by Law to be employed there; therefore desire he be called Home from thence. The Fifth Head was, against Priests and Jesuits, being the King's Native Subjects, to be protected, under the Title of Chaplains and menial Servants to Foreign Ambassadors: The House of Commons are informed, that the Spanish Ambassador is industrious in (fn. 4) advancing that Religion this Way, and hath Thirty or Forty Priests, who go in Lay Habits, and attend upon him as menial Servants, yet go abroad, and pervert and corrupt the King's Subjects in their Religion. Priests and Jesuits are Locusts and Vermin, that have done so much Mischief in Ireland, and may do the like here in England if they be not prevented; for their Opinions are, Juramentum Fidelitatis proprio suo Principi datum, Auctoritate Principis sive Præsidis Romani Pontificis posse dissolvi. The House of Commons desires their Lordships to take into serious (fn. 5) Consideration, and declare that Ambassadors may not retain Priests and Jesuits in Lay Habits, that are His Majesty's Subjects, under the Colour of Servants, to pervert the King's People. There was at this Conference delivered in certain Examinations concerning the Portingal Ambassador, which were not read. "After Sir Henry Mildmay, Sir Tho. Barrington desired, that a General Order might be sent to all Counties in England and Wales, that all the Magazines in every County may (fn. 5) be put under the Command and Power of the Lieutenant, that so it may be in such a Hand as the Parliament may confide in; for Bodies of Men, without Arms and Ammunition to defend and offend as there shall be Occasion, will be to little Purpose. This the House of Commons desires; because, it being moved the last Assizes in a County, One of the Judges denied that he had no Order herein, and had nothing to do in it, which the House of Commons tenderly resented, and desires their Lordships Concurrence herein." This House, taking these particular Propositions into Consideration, agreed with the House of Commons herein; and Ordered, That the Magazine and Ammunition in the Town of Monmouth shall be forthwith removed to the Town of Newport, by the Sheriff and the Justices of the (fn. 6) Peace of the County of Monmouth. Ordered, That the Arms and Ammunition of the Earl of Worcester, at Ragland Castle, Monmouth, or elsewhere, shall be removed to the Town of Newport, by the Sheriff and Justices of the Peace, there to remain in safe Custody. Ordered, That all Justices of the Peace, and other His Majesty's Officers, shall take Care, according to the Law, that none of His Majesty's Subjects do resort to any Ambassadors Houses, to hear Mass; if they do, to apprehend them. Ordered, That, if any English Priests or Jesuits, being Servants or belonging to any Ambassador, shall presume to go abroad, and pervert and corrupt any of the King's Subjects from the Protestant Religion, (fn. 7) they shall be apprehended, and proceeded in according to the Laws of this Kingdom. Ordered, That the several Magazines and Ammunition of every County shall be under the Power and Command of the Lieutenant of the County, for the Safety and Defence of this Kingdom. Ordered, That Mr. Chandler, now Consul for the English Merchants at Lisborne, in Portingall, shall be sent for Home, to appear before this House.